I love watching dramas, especially Korean and Japanese ones. And almost always I get addicted to the OST of the drama. Recently I have been watching a drama called You’ve Fallen For Me (Heartstrings) in some websites). I wasn’t really interested at it at first, though I wanted to see it because it’s another musical drama. But now I’m hooked to it, especially because of Min Hyuk (CN Blue’s drummer). Now in the recent episode of the drama, Park Shin Hye sang my favorite CN Blue song (sorry not giving spoilers). Though it has a different feel, but I love the song! So I am sharing her version. I have posted the lyrics of the song I Will Forget You sometime last year. It still is until now my favorite CN Blue song. For those who are not familiar, this song is not sung by Yonghwa, but by their other vocalist, Jonghyun. Most people don’t really notice him much because all the attention is on Yonghwa, but he has a good voice too (but in a different way). I found this video, a fancam taken from their showcase last year. Jonghyun still had that wavy rockstar hair, but I think he looks better with his new hair now. Anyway, up until recently, I learned that the song actually has an English version from their Japanese album, Thank You. 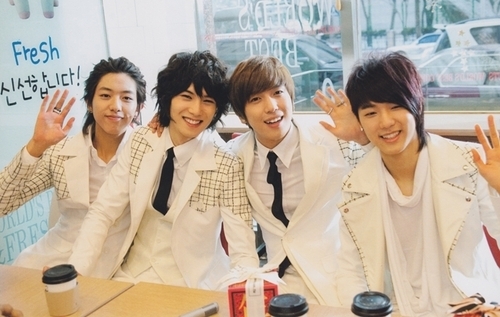 Unknown to most people, CN Blue had released an album in Japan before they released one in Korea. It has the same melody, but a different feel though, but their English is quite audible. No matter what the version is of the song, I still love it. Though it’s a sad one, but definitely people should hear this song especially if they’re mending a broken heart.